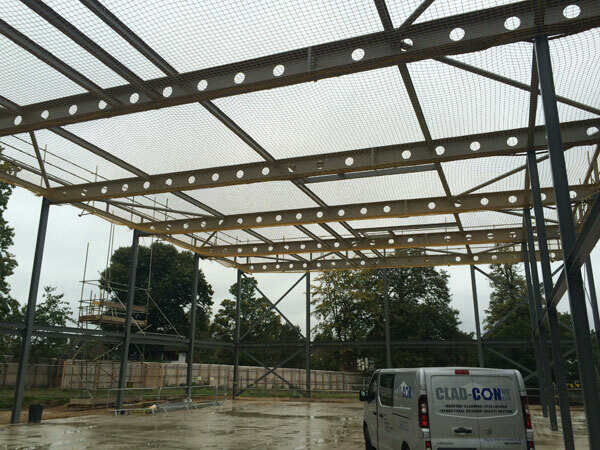 We supply and install safety netting. Our safety netting operatives all hold the relevant NVQ for Installation of safety nets. All of the Safety nets that we stock are manufactured in line with BS1263 part 1. They undergo visual inspections each and every time they are used. They all have the relevant certification to prove that they have passed their annual test for UV damage etc..
All Safety nets are installed and removed in line with BS1263 part 2. We follow FASET Best practice guide to installation methods rigorously to ensure all works that are undertaken on site are safe for both the installers and the end users who are working above the safety nets. We also offer over netting as part of our package. If you need a fragile roof replacing and we cannot get in your premises to install safety nets below the roof, we can use a technique called Over Netting. The safety nets are installed above the roof rather than below. The safety net is then trapped in the void between the old roof and the new over lay. This gives the installers fall arrest protection when working above the roof.